The retrograde in August begins with Pre-Shadow at 3:13 pm UTC on July 24. Because Mercury rules Virgo, the cycle should prove interesting! 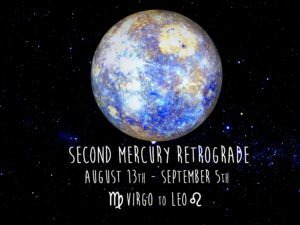 Mercury Retrograde station occurs at 1:00 am UTC, on August 13, in Virgo (11o38″). Note that in North America, the station occurs on the evening of August 12. Mercury Direct station occurs at 11:29 am Greenwich time on September 5 in Leo (28o25″), leaving the Post-Shadow at 3:59 pm UTC on September 19.